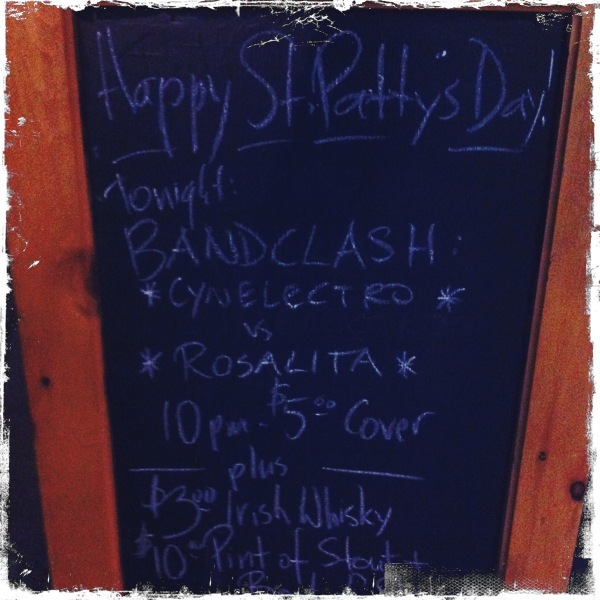 st paddy’s bandclash at oncue! on this past st. paddy’s day we had the unique opportunity to partake in not only some drinkin BUT we also took part in a battle of the bands for the first time! so the deal is each act plays a set, the crowd response at the end of the nite dictates who wins & the winner takes home $250. so for a fledgling band like our female led, all bruce springsteen cover band, Rosalita the chance to play is great & the chance to get paid=even greater! Oncue was the venue & patrons also got deals on food/bevvys/pool as well as sonic entertainment all night for a modest cover. t’was a great deal all around! originally 3 bands were on the bill but one dropped out last minute. the first group was a dance duo. they did a great job and the bar was set. Rosalita played a better set than our debut and from our standpoint behind the kit things went well. though for the 2nd show in a row, vocals were tough to hear (crowd had similar comments) but at least this time out we could hear all the instruments which was a HUGE bonus. our playing on the kit was decent enuff. we hadn’t had the time we’d hoped for rehearsing into the leadup to the show but managed anywho. also, it was a rare opportunity to get to use our own kit for a show. that was definitely a hilite for us! we were a sweaty mess by the end & the end of the set applause sealed the deal… Rosalita had won! our first ever personal foray into a “battle of the bands” setting was a success! its not a bad deal for patrons, the bands or the venue. the acts gain the stage experience (needed thx! ), the fans get to see diverse acts, and the venue gets a decent night of entertainment & patrons at a decent cost. our bonus for the night was the discovery of this wonderful brew! 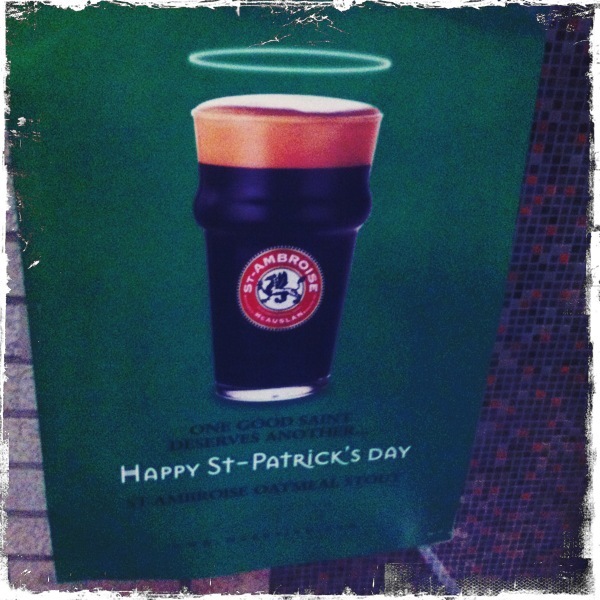 st. ambroise oatmeal stout! smooth and delicious! highly recommended if u happen upon a tap somewhere. next time we see it, it’ll be a no brainer choice! aren’t those the best choices to have? ’til next post! 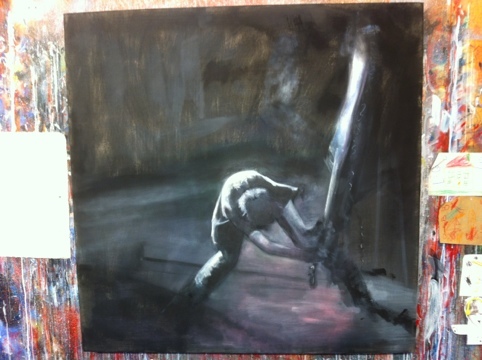 this pic of a painting was recently sent to us from our “paul” that plays in our bi-monthly all clash jam sessions. its a great take on one of our fave music images of all time. sooooo looking fwd to strummer nites on Easter weekend in the Hammer! hoping to be there for at least one of the 3 nights & if we can swing 2 nights, we will! note 2 self: lets effort to get the all clash jams bumped up to monthly ones! its far to long to wait between sessions! yup, its official! we’ve turned the page back a bit & returned to our roots by spinning tunes more often in 2012. the fine folks at The Schomberg Pub & Patio have been nice enuff to let us spin tunes every Saturday night starting asap. we will be there every Saturday night we are able to for the foreseeable future so drop by, have a pint & dance a bit! 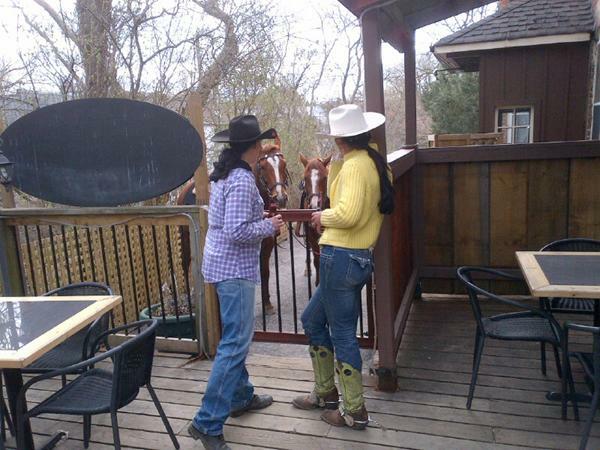 last weekend was a hoot & we look fwd to many more good times in the future. here’s a pic of the pre-dusk lineup to get in! remember our motto is “all styles, all fun!” so bring your best dancing shoes! so a week ago we were jamming on the kit with rosalita at the geary st rehearsal factory. after a song we realized there was blood drops on half the hihat cymbals & the snare. first we made the quick check that it wasn’t ours then got mildly disgusted. 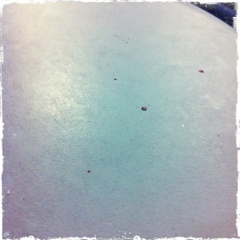 who bleeds on a hourly rental kit & then doesn’t clean it up? who doesn’t clean the gear? then we thought, why haven’t we come across this more often? 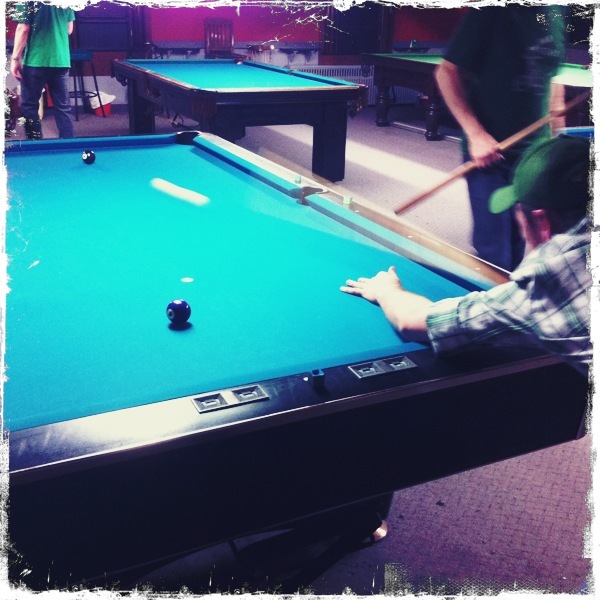 fret not, we moved the hihats/snare so we were hitting the non bloody parts & told the powers that be about the mess. 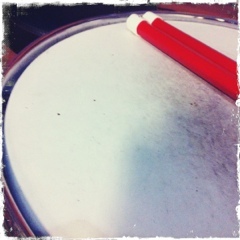 lo & behold we come back a week later to find the same blood drops (see pics) on the snare! the hihats had been cleaned or the blood wore off. but no attempt had been made on the snare. now we were truly disgusted. rehearsal factory loses big points for not cleaning their gear within a week! just an quick update. things are moving fast here at the Hills (as u likely guessed) due to the lack of posts. 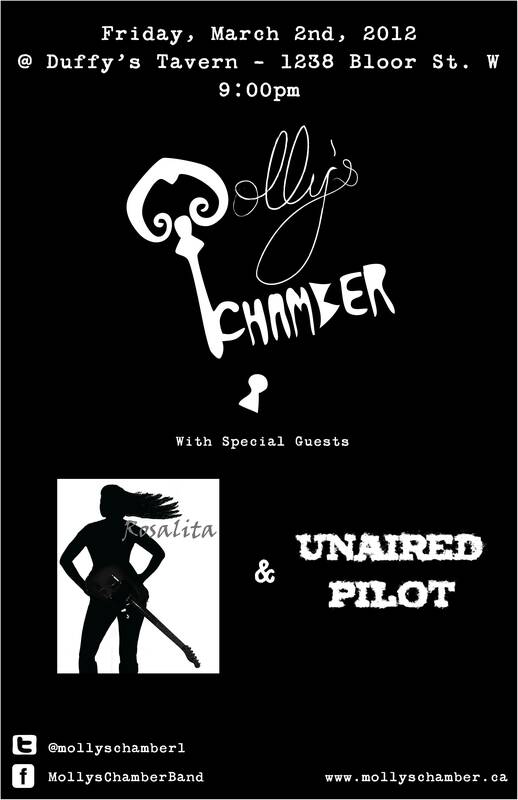 we had a killer show with Rosalita and Mollys Chamber on March 2nd at Duffys. 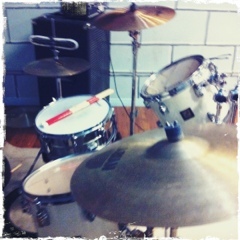 Playing the drum kit for the Rosas has been wikked fun & we are enjoying the vibe immensely. Mollys Chamber’s new singer was on display for the first time with the band & hit a homer out of the park. great times all around! Sadly though this was 2 be our last official show with the Chamber as we had to give our notice just this past week. it was a great 7 month ride with the band & we learned a helluva lot of new songs & we also learnt a lot about bass along the way. can’t wait to see the band at their next gig as we are 100% sure they will have no probs finding an eager replacement! if u know some1 interested apply at their website. more posts soon!